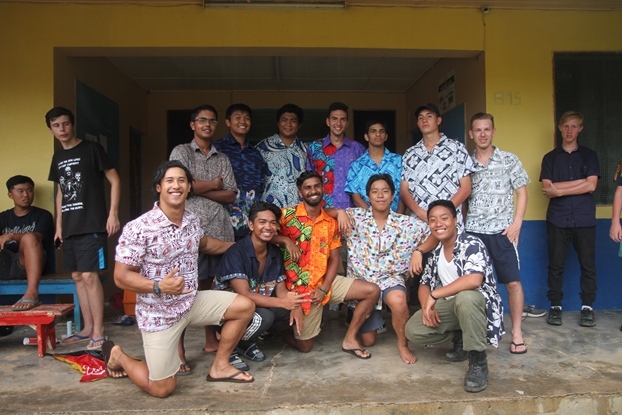 A group of 38 young men from Australia and New Zealand went to Vanuatu (a country made up of many islands 1,000 miles east of northern Australia) for two weeks in January to refurbish a school called College Technique San Michel that serves 400 students. The school is located in the town of Luganville on the island of Espiritu Santo, the biggest island in the country. Many of the students stay at the school during school term because they come from other islands. The school only charges the parents of the students a few hundred dollars (US) a year for an education, meals and board. This means the school doesn’t have the funds to pay for materials or the labor to refurbish damaged or old parts of the school. School fees are low because the average wage is lower than in developed nations, yet the cost of many things is the same as in the developed world. Food, cars, mobile phones, building materials cost the same in Vanuatu as in Australia. Many locals end up growing their own food due to the cost. The United Nations lists Vanuatu as one of the “least developed countries” in the world (there are only 46 other countries on the least developed country list). All the work campers set off at the beginning of January from various parts of Australia and New Zealand and converged in Vanuatu. The group was made up of fellows from six different states and territories in Australia and from various cities on the north island of New Zealand. The age range was larger than a usual work camp group, with the youngest only 14 years of age while the older fellows in the group were in their early 20s. Among those who came were a builder’s assistant from Melbourne and a tiler from Canberra. They had some handy tips for the refurbishment work and acted as guides to the younger less experienced fellows. 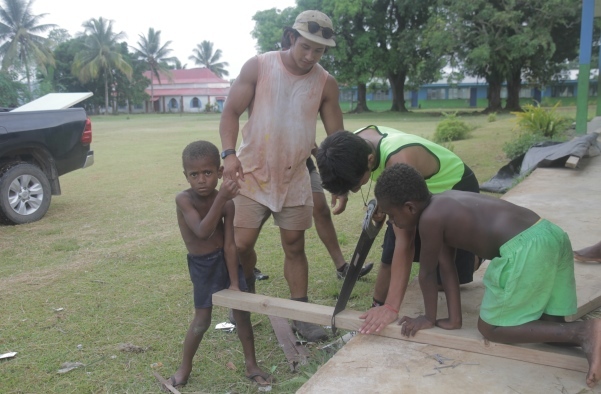 The various study centres in Australia and New Zealand (Nairana, Mirrabooka, Aldridge, Drummond, Glenrowan and Greywood), in conjunction with the charitable Australia based organisation Reledev, took an interest in the work project in Vanuatu after Warrane College in Sydney organized a work camp at San Michel in July last year to build a kindergarten. The feedback from that project was very positive. The locals were kind and helpful, the food and accommodation wasn’t too bad and there were places to buy building materials only a few minutes down the road from the school. The only difference was in January the heat and humidity was much more intense. 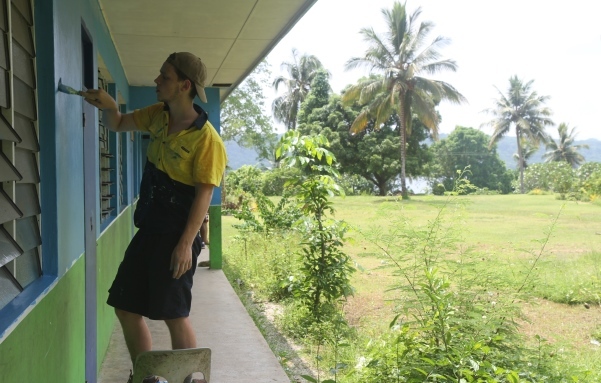 However the fellows adapted well and rarely complained and got on with the various projects involved in refurbishing the school. 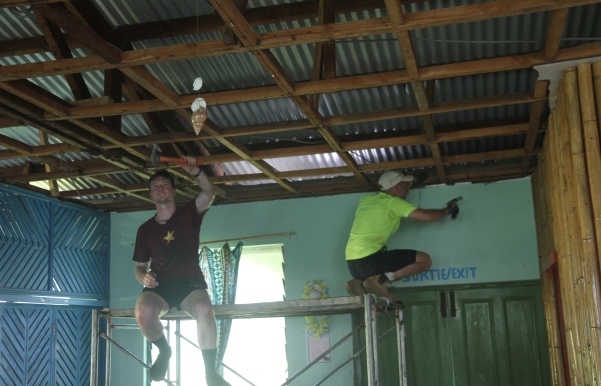 Eight classrooms were repainted, including the ceiling, walls and doors. Two ceilings of classrooms had to be completely replaced and also the ceiling of the entire dining hall which turned out to be a huge task. A drying room for clothes was built, the small administration office had a big interior and exterior makeover with walls being knocked down and fresh paint applied to the remaining walls. The outside of the entire primary school was repainted and the basketball court which was overgrown with weeds was cleared and repainted and the backboards were replaced. 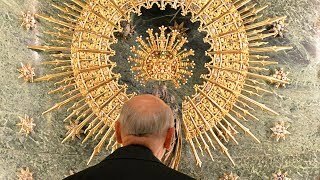 Each day a number of spiritual activities were offered including Holy Mass, meditation (guided prayer), the rosary and spiritual reading. Many of the fellows attended these activities and found their relationship with Our Lord growing over the course of the two weeks. After work the boys usually played some soccer or basketball, both of which are popular with the locals. Then many of them would go for a swim. The group also had three days off work where they explored the local area. Every excursion involved swimming due to the heat; the beaches in Vanuatu are incredibly beautiful and are a highlight for any visitors. For the first excursion the fellows went to a neighbouring island called Aore for the day. There they swam, had a barbecue lunch, a tropical drink (made up of different local fruits) and went for a tour of a bat cave and a small cocoa and coconut plantation. Next they visited Champagne Beach and Port Olry which by all accounts were the most beautiful beaches many of them had ever seen. “What I’ve learnt from this is basically offering up my work for God and trying not to complain as much and really, just not thinking about myself. Just being more selfless than selfish,” said Josh Pangilinan, a high school student from Sydney.